It is always important where you download your applications from. Take SafeGuard, for example. 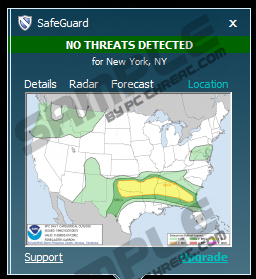 If you download this application from safeguardalerts.com, the application will work properly; displaying storm alerts and other notifications SafeGuard has been designed to show. However, computer security experts urge users to remove SafeGuard immediately if the application has been installed bundled with other freeware. In such a case, there is a good chance that you have more than just one potentially unwanted application, and if you do not take care of it at once, this could lead to severe computer security problems. The official website for SafeGuard says that with this application you can be “prepared for bad weather before it hits home.” As mentioned above, downloading the application from the official website does not cause any problems, but the point is that, most of the time, users do not come across the official website out of the blue. It is far more likely that unsuspecting users would download SafeGuard from third-party file sharing websites, bundled in software packages with some applications they have been looking for online. If this is what really happens, then users do not even realize they download this potentially risky application on their computer. Our research shows that SafeGuard is directly related to Desktop Weather Alerts and Severe Weather Alerts applications that are also supposed to inform users about the oncoming weather calamities. However, the bundled version of SafeGuard and other similar applications presents particular security-related concerns. If this application arrived in a software package, there is a good chance that it will not work properly. The main thing it will do is display commercial advertisements, and it will surely disrupt your web browsing experience. On top of that, these commercial pop-ups will most likely be embedded with outgoing links that are not reviewed by SafeGuard. Usually adware applications and potentially unwanted programs do not cover third-party content in their privacy policies. This leaves an opening for cyber criminals to misuse such applications for malware distribution and for online marketing schemes. SafeGuard has this kind of vulnerability that you should not ignore. Thus, if you want to keep your computer safe and secure, you must remove SafeGuard right now, following a thorough system scan with a licensed antispyware tool. This will help you detect and delete other potential threats that might be residing in your system. To safeguard your computer from similar infections in the future, be sure to invest in a reliable antispyware application. Move the mouse cursor to the bottom right corner of your desktop. Highlight SafeGuard and click Uninstall. Go to Uninstall a program and remove SafeGuard. Go to Add or remove programs and uninstall SafeGuard. Quick & tested solution for SafeGuard removal.